The Global Volcanism Program has no activity reports for Tafahi. The Global Volcanism Program has no Weekly Reports available for Tafahi. The Global Volcanism Program has no Bulletin Reports available for Tafahi. The Global Volcanism Program has no synonyms or subfeatures listed for Tafahi. The small 1.2 x 2.8 km island of Tafahi is a conical stratovolcano about 7 km N of the island of Niuatoputapu in the northern Tonga Islands. It is the northernmost subaerial volcano of the Tofua volcanic arc. The basaltic-andesite volcano is elongated in a N-S direction, and the summit is located on the SW side of the island. The W side of the volcano is the most dissected, and a narrow fringing reef partially encircles the island. No historical eruptions have been reported, but its youthful morphology, which resembles that of the larger Kao volcano in the Central Tonga Islands, suggests recent activity. Wendt J I, Regelous M, Collerson K D, Ewart A, 1997. Evidence for a contribution from two mantle plumes to island-arc lavas from northern Tonga. Geology, 25: 611-614. The Global Volcanism Program is not aware of any Holocene eruptions from Tafahi. If this volcano has had large eruptions (VEI >= 4) prior to 10,000 years ago, information might be found on the Tafahi page in the LaMEVE (Large Magnitude Explosive Volcanic Eruptions) database, a part of the Volcano Global Risk Identification and Analysis Project (VOGRIPA). There is no Deformation History data available for Tafahi. There is no Emissions History data available for Tafahi. Conical Tafahi, the northernmost subaerial volcano of the Tofua volcanic arc, rises to the NE beyond the northern shore of Nuiatoputapu Island. 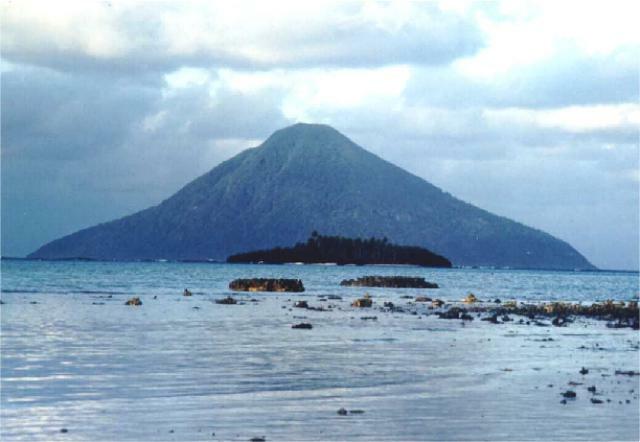 The small 1.2 x 2.8 km wide island of Tafahi is a conical stratovolcano that rises to 560 m about 7 km north of Niuatoputapu. No historical eruptions have been reported from Tafahi, but its youthful morphology, which resembles that of the larger Kao volcano in the Central Tonga Islands, suggests recent activity. Photo by Paul Taylor (published in Taylor and Ewart, 1997). There are no samples for Tafahi in the Smithsonian's NMNH Department of Mineral Sciences Rock and Ore collection. Large Eruptions of Tafahi Information about large Quaternary eruptions (VEI >= 4) is cataloged in the Large Magnitude Explosive Volcanic Eruptions (LaMEVE) database of the Volcano Global Risk Identification and Analysis Project (VOGRIPA).